Just to satisfy my own curiosity, since I don’t (sadly) have the opportunity to buy it or anything… In a lot of ways it looks like my Chandler & Price, but its position is throwing me off (and I’m so new to the letterpress world, anyway). Can anyone enlighten me? This is a Liberty press, made by F.M. Weiler. Not very common - we know of less than three dozen worldwide, counting ours in History Park in San Jose, CA. - so please tell us where this one is, to satisfy our curiosity! For anyone interested in Libertys, Dave Tribby has a page about them, and a “census,” on his excellent AAPA website (www.aapainfo.org/lpress). At this point all I know is that my parents took this photo somewhere in South Africa. My Dad had been working on my C&P during his visit from Australia and when he saw this he thought I’d be interested. It was either in a print shop or a small museum… I’ve asked them for more details of where it was so when they wake up, I’ll have some answers. Interestingly I didn’t see any South African locations on that list, so perhaps we have uncovered another….? I should add that the Liberty is a lot like the C&P, or actually, the Gordon, predecessor of the C&P, as the designer was F. O. Degener, of New York. He worked with G.P. Gordon, who developed the basic platen press around 1851, but Degener left the Gordon firm to go into partnership with F.M. Weiler to produce the Liberty around 1860. The main difference between Liberty presses and all the other Gordon-style platen presses is that the rollers are relatively stationary, only moving up and down in their slots, while the entire bed & form and ink disk travels back and forth under the rollers. This allows the bed to open out nearly flat behind the rollers and corrections can actually be made without removing the form from the press. Oh, interesting! I was feeling a bit silly for saying it looked a fair bit like my C&P until you said that. I kept thinking: Hmm, so many of the parts looks alike… but what’s with the ink disk lying like that? And why are the rollers down there? But you’ve explained it all! Thanks. Oops, sorry about the link, I guess maybe it should be www.aapainfo.org/lpress.html for the basic AAPA page. This newfangled web stuff simply isn’t as straightforward as handset type! And it certainly sounds like this is a previously unknown (to us, anyway) Liberty! Cool! Looking forward to any other info you can get from your folks. Actually I think there are a few others that have turned up relatively recently and aren’t on the list yet, but the total is still small, with only around a dozen we know of in the U.S. - but at History Park, we just use ours like any other press. 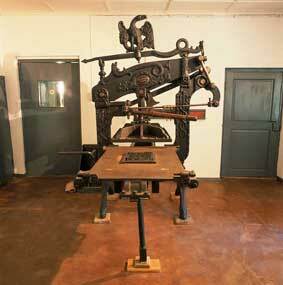 The press is in the Printing Works in the Church Square of Genadendal, the oldest mission station in South Africa. It was a Moravian Mission dating from 1738. 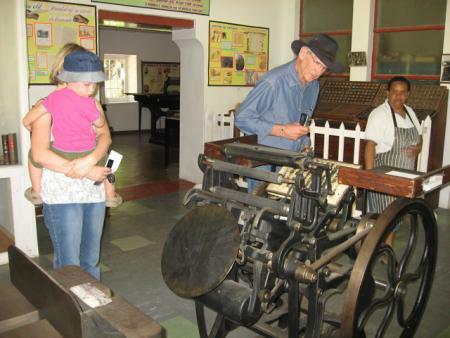 The Genadendalse Drukkery (Printing Works) opened in 1815 and is one of the oldest mission presses in South Africa still in operation. It was declared a National Monument in 1980. My sister stressed that the press pictured is located in the printing works, *not* in the museum. I’ve also been sent a picture of the other side of the press, which I’ll post in a minute. Here’s the other picture, showing the other side of the Liberty… my dad’s the one looking like he really, really wants to get his hands on that press. And finally… my sister pointed me to a picture of another of the original presses from the Genadendalse Drukkery, which is now in the museum in Genadendal. She didn’t take this photo, and I have no idea what it is – but it looks seriously cool. Thanks very much for the additional info & photos! We’ll have to see if we can follow up and find more info, and I’ll bug Dave Tribby, next time I see him, about updating his page with all the Libertys found in the last year or so. When closed, or nearly so, a Liberty looks a lot like a C&P or any Gordon-style press, but when open they do look a bit strange. Judging by the dust on the ink disk, the Genadendal Liberty doesn’t get used too often, but does look ready to go if they need it! Without more photos, info, or a serial number, it’s heard to tell the age of this press, but the delivery table to the left of the operator was shown in Liberty ads only a couple years, in 1886 and 1887. Since Libertys were made in Berlin after 1881 (as well as Brooklyn, NY), I’d guess this one may well be a Berlin-made press. 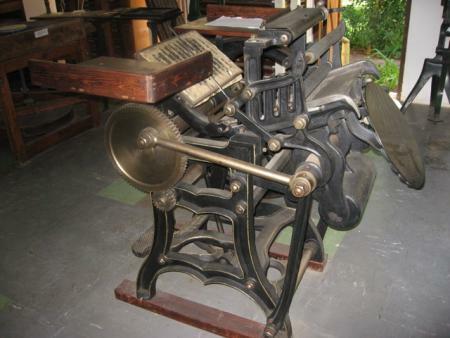 The older press, in the Genadendal Museum, is a Columbian, designed by George Clymer of Philadelphia in 1813. These incredibly ornamented presses were made in Europe after 1818 and were quite successful there, although they never were very popular in the U.S. despite the American eagle perched on top. If you can find a copy of the Spring 2007 (Number 10) issue of the Journal of the Printing Historical Society, it has an article by Erik Desmyter and me about the Liberty and Fred Otto Degener and F. M. Weiler. We listed 37 known Liberty presses worldwide at that time, and several additional ones have turned up since, not including this one. Thanks for the info — and the photos. Very nice Columbian, too — looks like it has its plaque, so the maker and serial number are probably recorded. Well, now I’m really glad my mum took those photos, and very pleased I decided to ask about them. If I find out anything else about it, I’ll post it here.